To Cite: Gholami S, Hamzehloei T. Hereditary of Alpha-1-Antitrypsin Deficiency, Shiraz E-Med J. 2013 ; 14(1):63-75. In this review article, in addition to the clinical manifestation of the alpha 1 antitrypsin deficiency, the genetics and molecular diagnosis of the disease and the effects of the causative mutations were reviewed. Alpha-1-antitrypsin (A1AT), also called alpha1-proteinase inhibitor (PI) (1), is the most common protease inhibitor in human plasma(2). The main function of A1AT is to inhibit the action of neutrophilic elastase (3), an enzyme that digests elastin, basement membrane, and other extracellular matrix components. A1AT is mainly produced by hepatocytes and its deficiency predisposes individuals to the development of emphysema and/or liver disease (4). Liver disease often manifests neonatally as cholestatic jaundice and in childhood or in adults as chronic liver disease (5). AAT deficiency (AATD) is a genetic disorder with autosomal recessive inheritance characterized by low plasma levels of A1AT and was first documented by Carl-Bertil Laurell and Sten Eriksson in 1963. AATD is relatively frequent in children with chronic hepatic disease of undefined etiology and/or low alpha-1-antitrypsin levels (41.6%) (6). As an acute-phase reactant, plasma A1AT levels increase rapidly (3-4 fold) in response to inflammation or infection and tissue concentrations of A1AT increases (11 fold) during an inflammatory response (7). The A1AT gene is highly polymorphic, and is located on chromosome 14q 31-32.3. It consists of seven exons and six introns. Most of the variants produce A1AT of normal quality and quantity (8, 9). Abnormalities of the A1AT variants usually were due to single amino acid substitutions (www.goldenhelix.org/A1ATVar). Population-based screening studies are the direct way to estimate the prevalence of severe alpha 1 antitrypsin deficiency. Studies from various regions of Europe have shown a large variation in frequency of the Z allele in different countries (10). The large population study in Sweden from 1972 to 1974 (11) and in Oregon from 1971 to 1974 (12) being most comprehensive. Of 200000 neonates in the Swedish study, prevalence rate was approximately 1 in 1600 newborns and of 107 038 newborn babies in Oregon study, prevalence rate was approximately 1 in 5000 (11, 12). The prevalence in the general population of Western Europe is approximately 1 in 2,500. The Z AAT mutation seems likely arose in Southern Scandinavia. The distribution of the S variant of AAT is quite different from that of Z, the highest frequency being reported in the Iberian Peninsula (10). This variant most likely arose in the Portuguese population (13). The National Health Information Survey in the USA estimated that 3.1 million Americans have emphysema. In one study that 956 patients with COPD were tested for AAT deficiency, showed that 1.9% had the disease (14). Under recognition of alpha 1 antitrypsin deficiency is a problem. When given a questionnaire addressing the number of doctors seen for symptoms attributable to AAT deficiency and the onset of AAT deficiency-related symptoms, the 300 patients studied reported a mean duration between the first symptom and the initial diagnosis of the disorder of 7.2 years (15). In another study, the mean delay between first symptoms and initial diagnosis is 5.6 years (16) that confirm long diagnostic delay. Because of the benefit of an early diagnosis expanded effort should be put towards early detection of the disorder. The gene encoding alpha-1-antitrypsin is called the SERPINA1 , located on the long arm of chromosome 14 (14q21-32.3) (17). The SERPINA1, previously known as the protease inhibitor (PI) gene, is 12.2 kb in length and organized into four coding (II, III, IV, V) and three noncoding exons (IA, IB, IC) Considerable genetic variation exists at this locus and more than100 allelic variants have been identified (18, 19). The promoter for AAT gene activates differently in hepatocytes and monocytes, which is regulated by a different group of transcription factors (e.g. SP1 family and HNF-1α for regulation the AAT gene in monocytes (20) and hepatocytes respectively) and humoral regulation (e.g., interleukin-6 and oncostatin-M) (21). In addition, cytokines have an effect on AAT gene regulation, dexamethasone and oestrogen may have a stimulatory effect on gene regulation of AAT gene (22). In the liver, there is only one transcript of AAT; however, there are a number of alternative transcripts in other cell types. Although AAT is mainly produced by the liver (23, 24), but monocytes, lung tissue (25), intestinal (26) and corneal epithelium (27) also have the ability to synthesize AAT; with appropriate stimuli, expression can be increased substantially (28). AAT deficiency is an autosomal co-dominant disorder and associated phenotypes are classified by a coding system, where the inherited alleles are denoted by migration of the molecule on isoelectric pH gradient from A (for anodal variants) to Z (for slower migrating variants). AAT alleles are categorized into four basic groups- normal, deficient, null and dysfunctional (Tables 1, 2) (29). Normal alleles are typified by normal concentration of 20-53 mmol/L. The most common alleles A1AT are the M variants with normal AAT levels. Deficient alleles lead to AAT concentrations typically less than 20 mmol/L that decreased functional activity of AAT. Deficient alleles (eg, Z allele, S allele, and rarer variants) are prone lead to lung or liver diseases, while those carrying null alleles are related only to lung diseases. Serum deficiency or absence of AAT occurs, because of alterations in gene expression at transcription or translation levels, or abnormal intercellular processing. Dysfunctional alleles (e.g., Fand Pittsburgh alleles) code for an abnormal form of AAT, which exist in a detectable level but does not function normally. aDysfunctional characteristics described are based on altered rates of association and inhibition of neutrophil elastase, and deficiency characteristics. Adapted from reference 20 with permission of the BMJ Publishing Group. Table 2. Deficient and Dysfunctional AAT Alleles (30). The precursor protein AAT consists of 418 amino acid residues, including 24-amino acid hydrophobic signal peptide. The mature monomeric AAT is a 52 kDa molecule and includes 394 amino acids and three carbohydrate chains coupled to asparagine (31, 32). The three β-sheets (A–C), nine α-helices and a mobile reactive central loop (RCL) at the C-terminal region are characteristics of AAT and necessary for its inhibitory activity (Figure 1) (33-35). The sequence coding for the RCL is located at exon V (36).The first 150 amino acids of AAT form a helix structure and seem to play a less critical role when compared to the C-terminal sequence (37, 38). Three carbohydrate chains are attached to asparagines at 46, 83 and 247 position (32). AAT has 9 methionine radicals, making it a potent antioxidant (39).The amount of mature AAT glycoprotein synthesized by the liver hepatocytes is approximately 32 mg per kg body weight, resulting into serum concentration ranging from 1.5-3.5 g/L with a circulating half-life of 4-5 days in normal adult human(40, 41).The most common defecient allele is PI Z which is results from the substitution of glutamic acid at position 342 by lysine (E342K) in exon V of the gene. The Z allele lead to the formation of a protein that aggregates as periodic acid-Schiff–positive inclusions of AAT within the periportal cells of the liver (42, 43) (Figure 2). In the case of ZZ, AAT deficiency, retention of polymerized aggregates of AAT in the liver hepatocytes (due to a process called loop-sheet polymerization) (44) might caused liver cirrhosis. Also loss of the natural antiprotease activity of AAT predisposes to emphysema. The S allele results from the substitution of glutamic acid by valine at position 264 (E264V) in exon III of the gene and the consequent formation of an unstable protein structure (45). Figure 1. Inhibition of Neutrophil Elastase By α1-Antitrypsin. Following docking (left), the neutrophil elastase (grey) is inactivated by movement from the upper to the lower pole of the protein (right). This is associated with insertion of the reactive loop (red) as an extra strand into β-sheet a (green). (Reproduced from Ref 18 with permission.) (35). Figure 2. 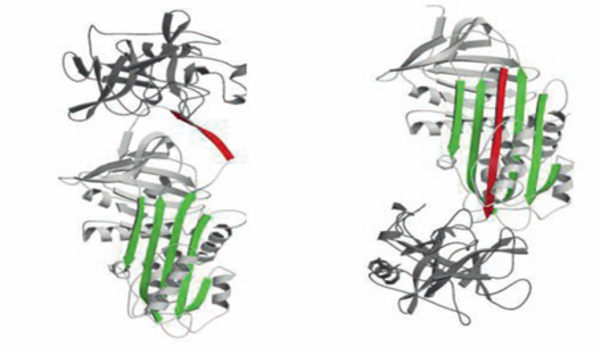 The Structure of α1-Antitrypsin is centred on β-Sheet a (green) and the Mobile Reactive Centre Loop (red). A substitution of lysine to glutamic acid at position 342 of the SERPINA1 gene configures protein Z (47) with widens β-sheet A and allows to polymerization (44) (Figure 2). Conformational instability of the β-sheet structure of the serpins underlies their susceptibility to mutations and polymerization (48). Although this process can occur under normal conditions, factors that encourage polymerization include high temperatures, high concentrations of Z-mutated AAT, and changes in pH (49). The low protein levels (approximately 15%) resulted from polymer formation of the molecules within the hepatocytes endoplasmic reticulum, with subsequent reduction in serum levels due to intracellular accumulation. In addition to protein Z, other mutations such as M malton give rise to proteins subject to this polymerization process (50). AAT deficiency related liver disease is caused by the accumulation of the abnormal protein AAT in the liver rather than the plasma deficiency. Therefore individuals with phenotypes characterized by intra-hepatocytes polymerization, such as Z, M malton (52Phe del), and Siiyama (ser53phe) alleles, can present liver disease (51). Null alleles, which produce no AAT, are not associated with cirrhosis or hepatotoxicity or liver damage (52). Only 10-15% of PiZZ individuals (homozygotes for Z allele) have clinically significant liver disease (53) and susceptible to liver damage as a result of the accumulation of Z molecules in the endoplasmic reticulum (ER) of hepatocytes. A1AT localizes both to the ER and to membrane-surrounded inclusion bodies (IBs). However, the question as to whether membrane-surrounded IBs, such as those containing ZAAT, are themselves toxic or, rather, protective to the cell has not yet being addressed. The nature of the serpin-containing IBs in respect to the ER is unclear (54). The liver injury occurs through a gain of function mechanism whereby retention of the mutant AAT molecule in the ER triggers a series of events that are eventually hepatotoxic, unlike the lung disease, which is due to loss of function. This gain of function is also the strongest evidence in ZAAT transgenic mice (55) where liver injury is evident although normal levels of anti-elastases in these mice are still present (56, 57). ZAAT is degraded in the ER and the proteosome is a key component of the degradation pathway (58). ZAAT interacts with a variety of ER chaperones, including calnexin, GRP-78/BiP, protein disulfide isomerase (PDI), and with the N-glycan modifying enzymes UDP-glucose (54). Binding and release of ATZ from calnexin are necessary for ZAAT degradation (59, 60). Misfolded proteins are then retrotranslocated from the ER lumen to the cytosol and degraded by the ubiquitin-proteasome system known as ER-associated degradation (ERAD) (54). The ER has very important role in protein folding and the handling of misfolded proteins. ER stress occurs as a result of an imbalance between the load of proteins facing the ER and the organelle’s ability to process them. ER stress is characterized by a number of cellular responses including ER overload response (EOR), the unfolded protein response (UPR), a decrease in protein synthesis, and apoptosis(61).ER stress induces a protective cellular response, the UPR, with increased level of ER chaperones. It has been reported that expression of ZAAT in the hepatocytes of transgenic mice and cell lines does not lead to a classical UPR with increased levels of ER chaperones (62). It is possible that the lack of UPR activation in response to ZAAT expression is due to segregation of ZAAT out of the main ER to the IBs (54). Because of the strong association between the ZZ phenotype and liver disease, testing for AAT deficiency should be done in all individuals “with unexplained liver disease, including neonates, children, and adults, especially the elderly” (63). In the lung, emphysema and chronic obstructive pulmonary disease (COPD) are common manifestations of AATD. AAT serum concentration is important in the protection against proteolytic damage of alveoli by neutrophil elastase activity in the lung (64). The lung disease occurs through a loss of function mechanism that decreases anti-protease protection on the airway epithelial surface (57). COPD and emphysema may be expected if the plasma levels of AAT are below the protective threshold of the normal value (protective threshold in serum is, the AAT ≥ 11μmol/L) (63, 65) or some dysfunctional molecules occurred. Finding in several studies suggest that not only Null, and ZZ alleles but also heterozygous MZ, MS, and SZ alleles may have a risk for developing lung disease (66).The emphysema associated with AATD usually develops by the fifth or sixth, and third or fourth decade of life in affected individuals who have never smoked, and who smoke cigarettes, respectively (41). The mean life expectancy of individuals with ZZ AATD is 60-68 years for nonsmokers (67). American Thoracic Society (ATS)/ European Respiratory Society (ERS) published guidelines for diagnosing and managing of AATD (63). Measurement of the plasma levels of AAT generally is the first step in the algorithm for diagnosis of AATD. However, AAT is an acute-phase protein and its production may be up-regulated during inflammatory and infectious processes (39, 66). In patients with clinical changes suggestive of AATD, such as all newborns with prolonged neonatal jaundice or bleeding disorder, all individual with a history of emphysema, asthma or COPD, all siblings of index cases, and all individuals with unexplained liver disease- the disease should be included in the differential diagnosis (47). Pediatricians who see newborns with prolonged neonatal jaundice or bleeding disorder have a wider differential diagnosis. These include viral infection, Wilson's disease, hemochromatosis and autoimmune hepatitis (41). Chest radiography and computed tomography reveal pan-lobular emphysema with characteristic basal predominance. Liver function disorders in early life are the first symptoms that develop in some homozygous ZZ patients. These infants develop cholestasis of varying degrees of severity associated with jaundice and elevated liver enzyme levels. Some cases may progress to cirrhosis and eventually liver failure, which is fatal unless the patient receives a liver transplant. This liver disease is caused by an abnormal accumulation of the Z variant of AAT in hepatocytes, although it is not known why only a small proportion of homozygous subjects develop the liver disease. Isoelectric focusing (IEF) is the most widely method that used to identify protein variants. This technique uses electrophoresis to separate the proteins by their isoelectric point in an acrylamide/bisacrylamide gel (SDS-PAGE). Differences in speed of migration of different protein variants on gel electrophoresis are related to variations in protein charge resulting from amino acid alterations. The Z allele results in a protein with the slowest rate of migration; but the M form of the protein has a medium rate of migration. Molecular diagnosis (genotyping) is an exceptional method for diagnostic confirmation in cases presenting discrepancies between patient's AAT levels and his or her phenotype identified, being also recommended for the identification of rare variants and for the study of new variants. Molecular analysis of the AAT gene is the gold standard for identifying rare allelic variants. To characterize the molecular basis of the "new" AAT deficient variant DNA sequence analysis of the coding exons of the alpha1AT gene carry out using an amplification DNA technique and direct sequencing. The method most often used consists in the amplification of DNA extracted from mononuclear cells by polymerase chain reaction (PCR) followed by cycle sequencing of the PCR products (68). Variation is found in the DNA sequence producing restriction fragment length polymorphisms (RFLPs). At least seven RFLPs have been identified within or flanking the AAT gene (30). Prenatal diagnosis of AAT deficiency can be performed in the first trimester of pregnancy. These diagnoses have been based on DNA technology using either RFLP analysis or hybridization with allele specific oligonucleotides (ASO) probes (69).Other determinations are the Neutrophil Elastase Inhibitory Capacity of AAT and assessment of Liver Function. Liver function is measured in patients with AAT deficiency by analyzing alanin aminotransferase (ALT or SGPT), aspartate aminotransferase (AST or SGOT), bilirubin, and albumin, as well as by coagulation tests (39). The most advantages of early diagnosis of AATD are; I. smoking prevention/cessation, II. Minimizing the hazards of occupational respiratory pollutants, III. The opportunities to receive augmentation therapy, and IV. the potential for family planning and guided genetic counselling/ testing (70).Early detection in symptomatic individuals may reduce the clinical and economic burdens of progressive lung degeneration. Early diagnosis of AATD permits the initiation of augmentation therapy when necessary.